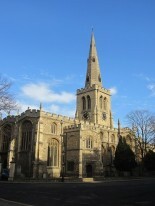 St Paul’s Church stands on St Paul’s Square in the centre of the market and county town of Bedford. Formerly a medieval collegiate church, the large building of cathedral proportions with its later additions and iconic spire dominates the town, and the church exercises a ministry of welcome to thousands of visitors and pilgrims annually from far and wide. King Offa founded St Paul’s Church as a new Minster which has been identified as a possible site of his burial. The church mentioned by name in the Domesday book was a house of secular canons in the eleventh century, ruled by an abbot in 971, and where Oscytel (or Oskytel), Archbishop of York was buried in 956, indicating that St Paul’s was an important minster church from at least the tenth century onwards. Historically, St Paul’s has played a key part in the life of the British nation: as the home for the BBC’s daily worship during the Second World War; and the Service for the National Day of Prayer in 1941, at which the Archbishop of Canterbury preached and the service broadcast to the UK and wider world. St Paul’s is today the Civic Church of the Borough of Bedford and the County of Bedfordshire; a focus for special celebrations and services for the borough, county, schools, university and the wider region of the East of England; and a central venue for concerts, recitals and exhibitions. As well as serving a diverse parish and ministering to a congregation of all ages, the church also enjoys fine choral and liturgical worship in the English cathedral tradition. While records trace the existence of a previous Collegiate church on this site as far back as 1066, the present church building, dating from the early 13th century, has since undergone numerous alterations, extensions, rebuilds and restorations. An Early English south porch survives from the original 13th-century structure, however. The restored Trinity Chapel dates from 1416. Other improvements in the 15th century include misericords in the quire (or chancel) and two additional porches. Architectural work to the church in the 19th century includes the tower and spire, transepts, choir stalls, quire and quire roof. Early 20th-century work to the church includes the magnificent Rood screen, the English Altar and altar rails. Later in the 20th century, from the mid-1970s to 1982, the church was restored and otherwise improved. The fine organ was rebuilt in 2011 and in 2014 new work was completed on a Narthex at the west end of the church. The tower has a fine peal of twelve bells. 15th century misericords in the Quire. The brasses of Sir William Harpur Lord Mayor of the City of London in 1562 and his wife Dame Alice Harper, and the grave of Sir William.